80 seconds! According to research is how long it takes for what you apply on your skin to get into your bloodstream. Our skin absorbs an average of 64% of total products you apply on it . 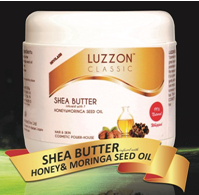 With Luzzonshea butter, you do not have to worry about harmful chemicals or carcinogenic (cancer-causing) substances. Luzzonshea butter also has the Luzzon Classic variant that is enriched with Moringa seed oil and honey … so much skin goodness! 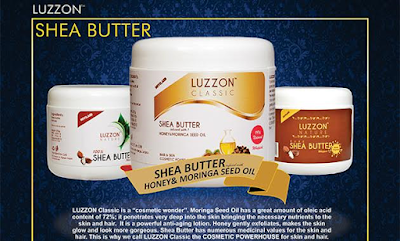 All Luzzonshea butter products have been treated to remove any impurities and foul-odor in our freshly harvested organic shea. Moringa oil and honey provide all the anti-aging properties you need in your body lotion giving you a radiant glow and healthy luscious skin! 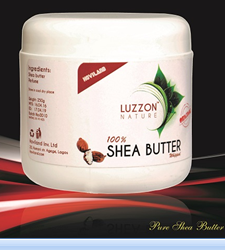 So take care of your skin and make decisions that your body will be thankful for - using any Luzzonshea butter variant. I have been using Luzzon classic shea for about 4 months now. I bought it in Nigeria before I travelled back to school in the US. My skin and hair have never felt so well-pampered. I give Luzzon classic a 5-star rating and I am happy I dont have to worry about harmful chemicals in a bid to maintain healthy hair and skin. Stephanie, Student. Join Stephanie and many others to take keen interest in the chemicals you allow on your skin in order to protect yourself and family, especially children and babies that have developing organs. Many body care products might not cause immediate reactions but these can slowly build up in us over time. 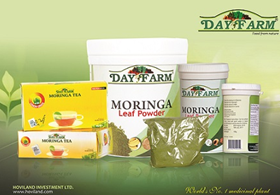 Also check out our Moringa Tea and Powder products on sale in SHOPRITE and SPAR nationwide. You need moringa in your 'life'. 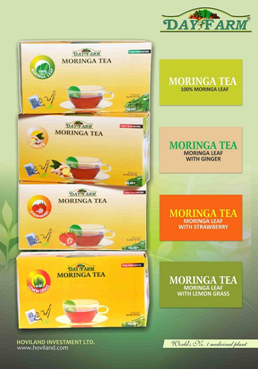 I make no exaggeration when I tell you that moringa is world's number one medicinal plant . (You can Google this for yourself). For vitality, immune boost, vitamin supplement and much more for both young and old. *Brown et al. The role of skin absorption as a route of exposure for volatile organic compounds (VOCs) in drinking water. Am J Public Health. 1984 May; 74(5): 479484.